Food. Our need, our want, our lifter and our downfall. I like to eat. I like to eat sweet things and I like to eat bread. I like to eat alone and I like to eat with a group. I like to go out to dinner and I like to cook. Food brings people together like nothing else can. We console one another with it when someone passes away. We use it in celebrations like when someone gets married, has a baby, gets a promotion or a good grade. We use it for fuel when our body is weak. But too often, we abuse food. We abuse our body with food. We put in too much. We put in the wrong kind of food. And when we do that, we are neglecting and, in a sense, abusing the temple of the Holy Spirit. 1 Corinthians 6:19-20 says, “What? know ye not that your body is the temple of the Holy Ghost which is in you, which ye have of God, and ye are not your own? For ye are bought with a price: therefore glorify God in your body, and in your spirit, which are God’s.” When you stop and consider that, eating that extra piece of cake takes on a whole new meaning. The problem is that I rarely stop and see things from that perspective. I just go about my business, eating this and that, thinking that, “oh, tomorrow I will do better.” Unfortunately, tomorrow is a long time away. I need to look at this thing and address it now. I don’t want to be a size 0 but I do want to feel good about myself and be able to look at myself in the mirror with a positive outlook. I want to be able to use my body in the way that the Lord wants me to use it. If I am sick from a preventable disease just because I was too focused on my own selfish desires, I can’t work or serve like I need to. Remembering that can be quite a challenge. This week, when you are thinking about what and when you eat, think about this – What are you going to eat? Will it fuel your body or fuel your desires? When are you going to eat? Are you hungry or are you bored? Remember, we are to glorify God in all that we do. Are you glorifying God by what you eat? My husband and I have been married for 22 years, 4 months and 13 days. It’s always the years that gets me. I have been married over half of my life. Our 22 years have been far from perfect but they have probably been as close as one can get this side of eternity. God has been good to us, not because of anything we have done or deserve. No, God has been good to us because He loves us and we each loved Him before we loved each other. Society has a warped view of love these days. They have no clue what it is or what it means. They see the things that Hollywood tells us should be love and attempt to base their thoughts and feeling on that. And that just does not work. The ideas and actions we see on our television and movie screen are far from the long lasting love spoken of here in 1 Corinthians 13. I mean look at it – “suffereth long” – long suffering is not a quality I would say that most people have. “Envieth not” – really, you don’t want me to be jealous of my special someone? The world teaches that jealousy is something that is a positive quality; it drives a person. “Vaunteth not itself, is not puffed up” – pride. Need I say more? “Doth not behave itself unseemly” – inappropriate behavior toward another person is everywhere. “Seeketh not her own” – self-centered behavior, the hallmark of our modern world. “Not easily provoked” – wearing your heart on your shirt sleeve – political correctness? “Thinketh no evil” – “get them before they get you” kind of an attitude. See, it is really tough to see true love in our world. That is why we are encouraged to find all the answers in Christ. When we look to the world, we have to remember that the devil has his grubby little hands in everything in the world. If he can get us to warp our view of love and see it as the world sees it, he can bring us down to the depths of his misery. And we all know that misery loves company. Jesus is our perfect example of love. His life, His ministry, His death and resurrection all show us how, when and why we should love. And the love that is spoken of here isn’t just for the people choosing marriage. No, this love should be blanketed over everyone in every situation and saught after in every circumstance. So let me encourage you today, to love. Read these verses and let them sink in and let them change the way you do things today. Put on love and let it guide you today. When my family and I started going to our church, we were a bit puzzled. Everyone was identified as aunt or uncle so-and-so. How could all these people possibly be related? True, it has been around for 120+ years and dating someone in our church requires a careful analysis of both people’s family tree, but still..all of them related? We quickly learned that these were terms of endearment. My church is far from perfect. We have problems. We have challenges. But above it all, we have love. And there is no better place to see love than at a funeral. Now, I know, that seems weird. But hear me out. One of our ladies passed away this week. She had fought long and hard against an illness that rarely gives up – cancer. It was sad. And it was a blessing. She had been ill for so long and endured so much. She was ready to see Jesus. And as we sat and listened to the pastor give his words of encouragement, the common theme was “amen”. He talked about her faith; her dedication when she was ill; her love for her family and her Jesus. Amen. She isn’t hurting. Amen. She wants her family to share in her joy. Amen. Her family was not only flesh and blood but also the blood of Jesus Christ. And no truer words can be spoken when I think about my church family. I love my family dearly, blood of my relatives and blood of my Jesus. They are all precious to me. And yesterday, as we laid to rest one of our own, my heart was sad for the ones left behind but happy for her. It was bittersweet. So I would encourage you to go home to your church family this weekend. They would love to see you. They would love to hug you. They would love to tell you how much they have missed you, because they have. Don’t let the devil steal away the family that God has given you. Treasure it and thrive within it. Yesterday, I visited a couple who has been married 56 years. He is vibrant and swam a 1/2 mile that morning in the pool. She, on the other hand, is failing. Her health is less than good and her mind wavers. Yet, as she needed attending for whatever reason, he did so without complaining, without harshness and with loads of compassion. He encouraged her when she successfully completed a 30 second stand without grasping her walker. People today don’t always understand and appreciate that kind of love and devotion. When things get tough and they feel their needs aren’t being met, they leave. This couple encouraged me with stories of their time apart when he was away doing his job. I can see him leaving home to get on a plane in the 60s while his wife stayed home with the children. I can see her opening the door with a smile on her face when she sees him walking up the front sidewalk. I can see him watching her cook dinner while the children run in and out the door and they talk of what all has gone on through the week. And as time passes, I can see him sitting by her bed holding her hand while she struggles to understand why she just can’t remember. Love. Love is something that is challenged every day. It is a choice we make every day. I choose to get up in the morning and love my husband no matter if he is beside me or on a trip for his job. I choose to stand by him when he is sick and when he is happy. I choose to love him when he carries out the trash and when he makes me madder than a wet hen. Love isn’t about warm fuzzy feelings and thinking like you are the center of his world. Love is knowing that when you just can’t remember, he will be there. Love is knowing that when you can’t stand by yourself, he will be there to hold you up. Love is a choice. I truly believe that we can’t love our spouse without loving Jesus first. You see, He is love. He shows us how to love. So this weekend, love. Choose love. Always, choose love. Happy Friday. Sometimes in life, we have to stop and evaluate the people with whom we spend our time. Especially as adults, we don’t want to think or consider that our “friends” are really not a positive influence in our life. It’s a lot easier to hand out a bucket of excuses than to say “Yep, these people are the rotten bananas in my fruit salad!” Admitting that people in your life are a problem is tough because we care about them. We see that we are a positive influence in their life. We know that without us, who knows where they would be. But what we fail to realize is the yuck they are bringing into our life each and every day. They bring problems. They bring speech patterns that fail to glorify God. They bring hate and discord. And as much as we think that we can resist these negative influences, eventually they will have an effect on us. If you are around a negative person all the time, there’s a good chance that you too will start to see things negatively. Children are especially vulnerable. They just want people to like them. They want to be popular. They want to be accepted by the “cool kids”. But as a parent, it is my responsibility to guard them from times like these. And just like I have to monitor my own relationships, I have to monitor theirs as well. When I see that it may be time to walk away, I need to be there to provide whatever they need to make that tough decision. The One thing that we as followers of Christ can give ourself and our children is the gift of having Jesus with us every step of the way. We don’t have to make those determinations ourself. We can let Jesus show is the rotten bananas. We don’t have to have the words to explain our decision. We can allow Jesus to give us what to say in those situations. We don’t have to feel alone when we do walk away. Jesus promised to never leave us or forsake us no matter the age, no matter the situation, no matter the level of hurt. So let me encourage you to evaluate your circle and the circle of people surrounding your children. Make sure that the influences in your life are wholesome and bring honor and glory to God. Don’t you love my new shirt?! I saw it and had to have it! Pineapples are one of my most favorite fruits. I could eat them everyday! Traditionally, they have been used to indicate hospitality. But I love what is being expressed here! “Stand tall” – Don’t let the world try and get you down. I know it’s hard. I know you feel beat down. I know that the days are getting longer and you are weary. I am too. But we MUST stand tall. We have to show the world that Jesus has given us a backbone that will not bend to the whims of this world. “Wear a crown” – Remember, you ARE a child of THE King! Act like it! “Be sweet” – Words can make or break people. Let yours always be seasoned with love. Be the one that everyone wants to be around every single day. And remember, pineapples get sweeter with age, not more and more sour. 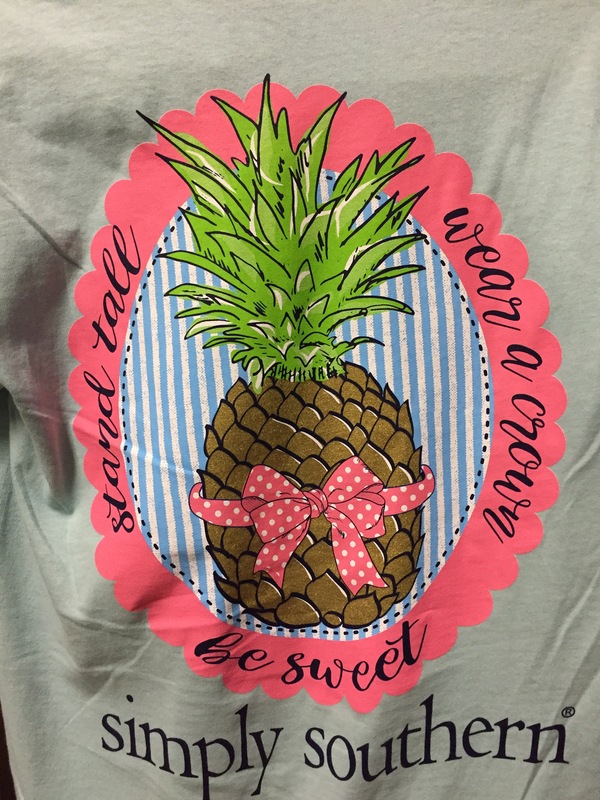 So the next time you see a pineapple, remember – God put them here for our enjoyment and to occasionally remind us to stand tall, wear a crown and be sweet. Life is too short to be anything less than a pineapple.